Even though it is Feb here, it is time to start the spring seeds. I am starting cone flowers and columbine’s for a wild flower garden out back. They need to be “pre-chilled” which means planting and then keeping in the refrigerator for a month. I don’t know about you, but I don’t have that kind of room. Fortunately, we live in Chicago, and I just kept them outside for a month. The cone flowers came up in less than a week, and the package says they should take 2. The columbine take 21 days to sprout, so we will see when those emerge. 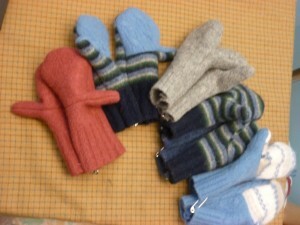 Do you like felted mittens? Pattern with PDF true size printable pattern is coming soon. My son’s pre-k class has a month long unit on the oceans. 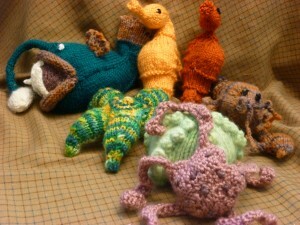 Last year I loaned them some sea animals I made for my son. This year, he finally said we can donate most of them- all except the Black Devil Angler fish. Most of these are Hansi Sigh, but a few of them are from Ravelry. The Sea horses are an original pattern. Someday I might publish it. 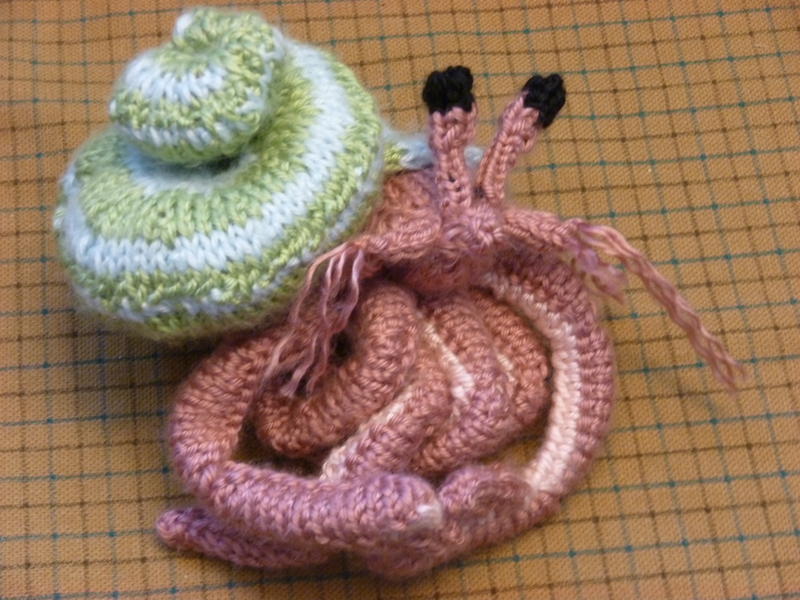 The kids’ favorits are the black devil angler fish and the hermit crab. The teacher likes them because they are durable but anatomically correct. The teacher has a sun star, star fish, brittle star, sea urchine, octopus, lobster, giant squid, two sea horses, hermit crab and three jelly fis. Betz White had the idea of making totes out of thrift store placemats. I took it a step further by useing thirft store belts as handles instead of purchased webbing. 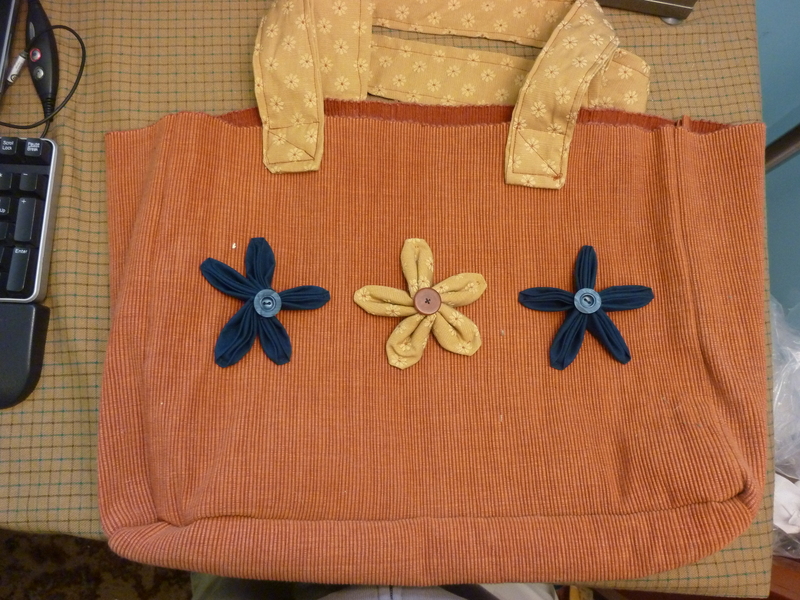 I also decorated the totes with Kazanashi flowers. I found 7 placements that were in good shape and I was able to get 2 totes out of them. Four for the front and backs, two for the sides and one for the bottoms. 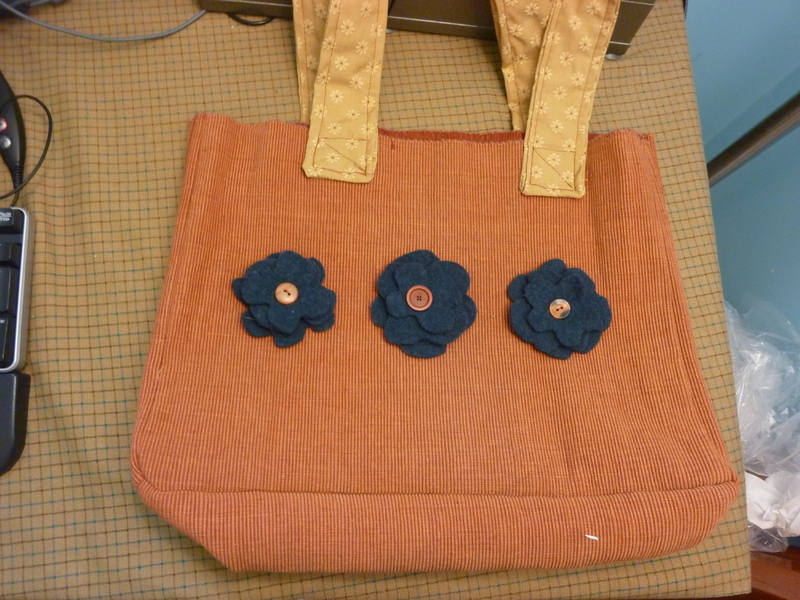 I then decorated one with Kazanashi flowers and the other with felted flowers and buttons. Top them off with thrift store belt handles and you have a beautiful, green, thrifty gift. These will be Christmas gifts– so if you know me, who will be for whom? Here in Chicago I had a growing season almost to the end of November before I had to put my garden to bed. I took all the pots from the side yard and put them under a sand box next to our wall, packed in real tight. I am hoping that it will keep the temperature even enough that the perennials survive. Even in January the parsley is still green! While I can’t be out with the dirt I have been crafting. My new passions come from Betz White’s sewing green that I got for Christmas. I have been making Morsbags and totes out of reclaimed linens that I found at the Salvation Army and other Thirft stores. See later posts for details.